Need a good, reliable, but affordable ammunition for range training? 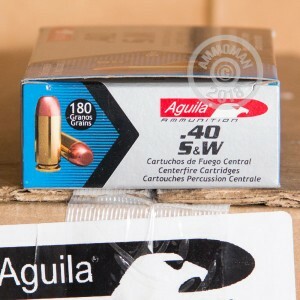 Then 50 Rounds of this 40 Smith & Wesson Full Metal Jacket ammo from Aguila is just what you're looking for! Being the exclusive manufacturer of ammunition for the Mexican military and police forces, you know you will be getting quality ammunition when you order Aguila. With this order, you will receive 50 Rounds of brand new Centerfire ammo. Each cartridge contains a 180 grain, Full Metal Jacket bullet, ideal for target practice. 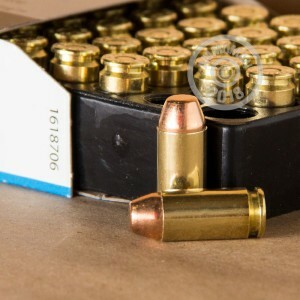 The non-corrosively primed brass case is great for reloading. 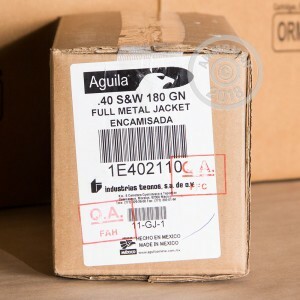 Founded in 1961 by Remington, Aguila Ammunition is manufactured in Cuernavaca, Morelos, Mexico by Industrias Tecnos, S.A. de C.V. Aside from being a preferred brand in Mexico, Aguila also sells to the Middle East, South America, and Europe. They are one of the largest Rimfire manufacturers in the world.